Not having enough to do in January, 1983, he accepted the Co Chairmanship of the Guadalupe Festival Committee along with his wife, Eralia. Working along with the 25 volunteer members who compose the committee, they conducted the 5th annual festival for Our Lady of Guadalupe Catholic Church at the Monument Valley Park. The festival included 16 booths of various types, bingo games, Mexican and Spanish music and songs, and a kitchen crew headed by Elfego Gomez, which sold out all Mexican, Italian and American food items on hand. The Mariachi Mass on Sunday, August 14 was celebrated by his Excellency, Bishop Richard Hanifen, the Pastor Rev. Francis Colom and Rev. Salvador Arufe, MG and the Guadalupe Mariachi Alegre. The Queen Contest, another highlight of the Festival coordinated by Miss Irma Valerio, resulted in the selection of Miss Wendy Moore as Festival Queen. Her attendants were Miss Michelle Martinez, 1st runnerup and Miss Tina Loyise Orabuena, 2nd runnerup. The Queen Presentation Ball was conducted on Saturday September 10th at the Broadmoor International Center to wind up as the biggest and most successful festival for Our Lady of Guadalupe Church. A recognition dinner was held for all Guadalupe volunteers on September 23 at the Moose Lodge Home to honor all parishoners who gave their time and effort to the festival project. 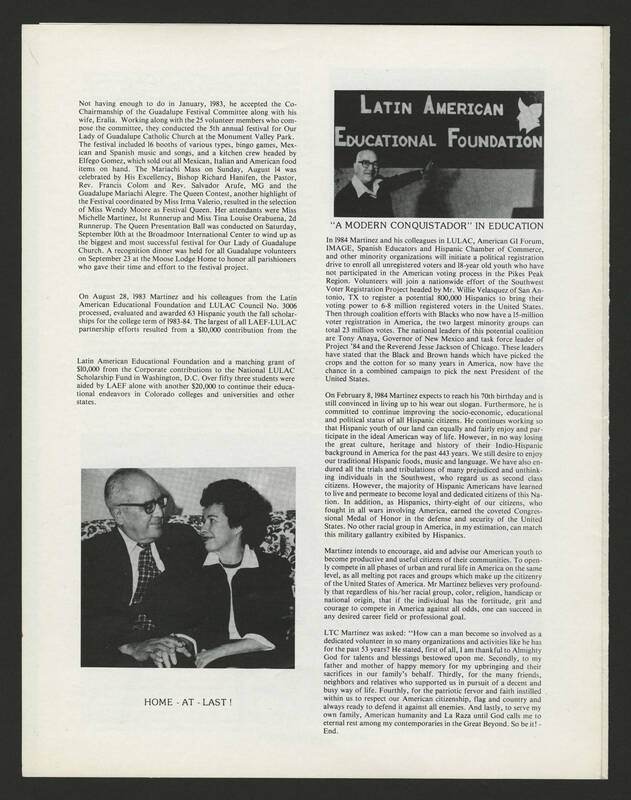 On August 28, 1983 Martinez and his colleagues from the Latin American Education Foundation and LULAC Council No. 3006 processed, evaluated and awarded 63 Hispanic youth the fall scholarships for the college term of 1983-84. The largest of all LAEF-LULAC partnership efforts resulted from $10,000 contribution from the Latin American Educational Foundation and a matching grant of $10,000 from the Corporate contributions to the National LULAC Scholarship Fund in Washington D.C. Over fifty three students were aided by LAEF alone with another $20,000 to continue their educational endeavors in Colorado colleges and universities and other states. HOME AT LAST ! LATIN AMERICAN EDUCATIONAL FOUNDATION "A MODERN CONQUISTADOR" IN EDUCATION In 1984 Martinez and his colleagues in LULAC American GI Forum, IMAGE, Spanish Educators and Hispanic Chamber of Commerce, and other minority organizations will initiate a political registration drive to enroll all unregistered voters and 18 year old youth who have not participated in the American voting process in the Pikes Peak Region. Volunteers will join a nationwide effort of the Southwest Voter Registration Project headed by Mr, Willie Velasquez of San Antonio, TX to register a potential 800,000 Hispanics to bring their voting power to 6-8 million registered voters in the United States. Then through coalition efforts with Blacks who now have a 15 million voter registration in America, the two largest minority groups can total 23 million votes. The national leaders of this potential coalition are Tony Anaya, Governor of New Mexico and task force leader of Project '84 and the Reverend Jesse Jackson of Chicago. These leaders have stated that the Black and Brown hands which have picked the crops and the cotton for so many years in America , not have the chance in a combined campaign to pick the next President of the United States. On February 1984 Martinez expects to reach his 70th birthday and is still convinced in living up to his wear out slogan. Furthermore, he is committed to continue improving the socio-economic, educational and political status of all Hispanic citizens. He continues working so that Hispanic youth of our land can equally and fairly enjoy and participate in the ideal American way of life. However, in no way losing the great culture, heritage and history of their Indio-Hispanic background in America for the past 443 years. We still desire to enjoy our traditional Hispanic foods, music and language. We have also endure all the trials and tribulations of many prejudiced and unthinking individuals in the Southwest, who regard us as second class citizens. However, the majority of Hispanic Americans have learned to live and permeate to become loyal and dedicated citizens of this Nation. In addition, as Hispanics, thirty eight of our citizens, who fought in all wars involving America , earned the coveted Congressional Medal of Honor in the defense and security of the United States. No other racial group in America,in my estimation can match this military gallantry exhibited by Hispanics. Martinez intends to encourage, aid and advise our American youth to become productive and useful citizens of their communities. To openly compete in all phases of urban and rural life in America on the same level, as all melting pot races and groups which make up the citizenry of the United States of America. Mr. Martinez believes very profoundly that regardless of his/her racial group, color, religion. handicap or national origin, that if the individual has the fortitude, grit and courage to compete in America against all odds, one can succeed in any desired career field or professional goal. LTC Martinez was asked: "How can a man become so involved as a dedicated volunteer in so many organizations and activities like he has for the past 53 years? He stated, first of all, I am thankful to Almighty God for talents and blessings bestowed upon me. Secondly, to my father and mother of happy memory for my upbringing and their sacrifices in our family's behalf. Thirdly, for the many friends, neighbors and relatives who supported us in pursuit of a decent and busy way of life. Fourthly, for the patriotic fervor and faith instilled within us to respect our American citizenship, flag and country and always ready to defend it against all enemies. And lastly to serve my own family, American humanity and La Raza until God calls me to eternal rest among my contemporaries in the Great Beyond. So be it! - End.